I first learned about pomegranates from my husband's family. His grandpa brought some pomegranate cuttings from the family farm in Nevada when he moved to California over 50 years ago. His grandpa lived to be 99 years old and his Grandmother is now in her 90s and still takes good care of the pomegranates that grow strong in her backyard. 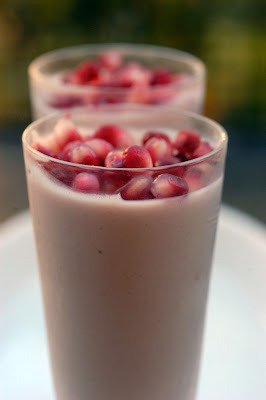 His family has many good pomegranate recipes and to add to the tradition I decided to create one of my own using fresh pomegranates and POM juice. Using a stand-up mixer whip the heavy cream on medium speed for 3 minutes. Add the sweetened condensed milk and 1 cup of POM Wonderful 100% Pomegranate Juice and mix for an additional minute. Bring to a boil the remaining 1/4 POM Juice. Once the juice begins to boil add it to the dissolved gelatin and stir for 30 seconds. 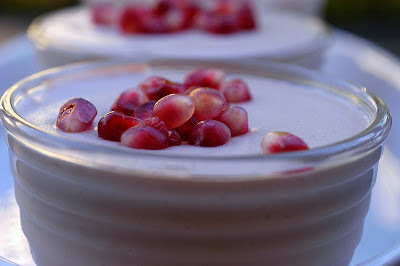 Refigerate for 1 hour and garnish with pomegranate arils. tony said he never ate a pomegranite until he met me. he had his first sweet hunt pomegranite this last trip to sacto, so it was worth it. looks yummy. Nossa, eu estou com água na boca, agora! Vou ter que correr para o supermercado. Thanks Natalie. Coming from you I am totally flattered. Seriously yummy! I love poms and this looks great!!! Oh yum, this sounds SO good! The gorgeous pictures definitely make it sound even better. I'm craving this as I read it. I could use some of that right now! Pomegranates are oh-so healthy and delicious! I wish they grew in my backyard too :). Your smoothie looks so tasty and nutritious! 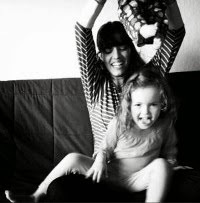 I'd love to include it on our blog, please let me know if you're interested :).